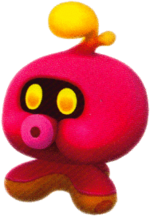 Octoguys, also known as Octoomba Leaders, are recurring enemies in Super Mario Galaxy and Super Mario Galaxy 2. They are different from the other Octoombas as they shoot rocks in an arc and both pursue or flee from the player while attacking. In Super Mario Galaxy, they are semi-common enemies appearing in mass numbers in the Honeyhive Galaxy, Buoy Base Galaxy, Gold Leaf Galaxy, and Deep Dark Galaxy. In the Honeyhive Galaxy, they appear in the water-filled planet, trying to prevent Bee Mario from getting to the Queen Bee. They also appear on the Queen Bee's planet. Two of them appear on the fortress in the Buoy Base Galaxy. In the Gold Leaf Galaxy, three of them appear around the big tree in the first mission and five appear on the final planet of the second mission in the water-filled section. In the Deep Dark Galaxy, they guard a Fire Flower that is needed for Mario or Luigi to proceed through the level. A lone Octoguy also appears in Bubble Blastoff, trying to knock Mario off a pole he is climbing. In Super Mario Galaxy 2, Octoguys return. They appear in the Boulder Bowl Galaxy, in the Honeyhop Galaxy and Shiverburn Galaxy's Prankster Comet mission. Octoguys resemble Octoombas, but have several differences. They are a magenta color, have a chubbier face, and a calm default expression. Their antennae have a unique shape, with a large and a small bulb at the end. Their tripod feet are smaller and flatter, and have orange soles and visible suckers like those of an octopus. When trying to hop away from Mario, Octoguys may tire themselves out and catch their breath for a short while, giving Mario time to attack. This page was last edited on February 21, 2018, at 05:06.